Discussion in 'New Player Questions' started by tr1age, Sep 14, 2016. We support the OrionUO Client info on that below the normal install guide! For those who would like a more in depth instructional here it is! 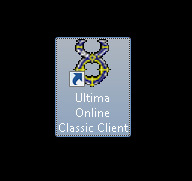 Or head to https://uo.com/client-download/ and download the classic client there. 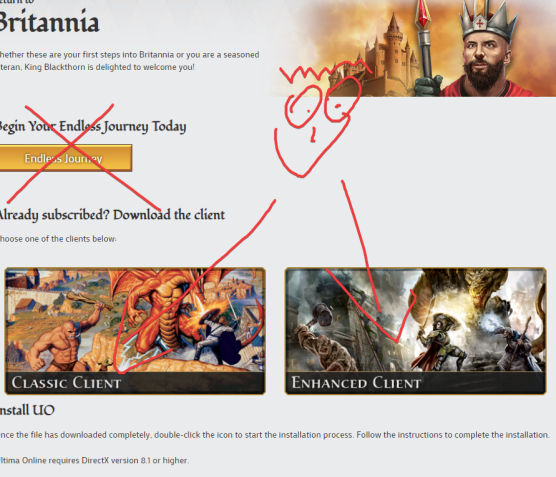 (which is the same as the link above) JUST DO NOT INSTALL THE ENDLESS JOURNEY CLIENT. 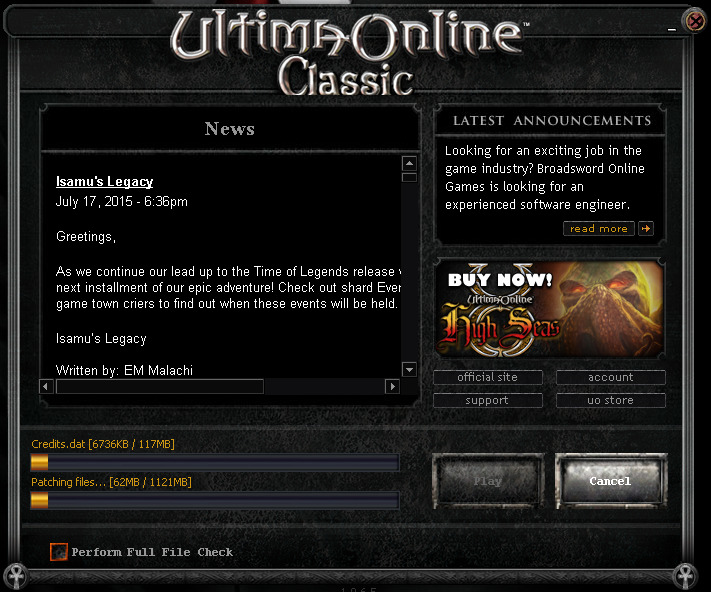 THAT IS THEIR LIMITED F2P CLIENT WITHOUT ALL THE FEATURES OF THE FULL GAME!!! Ho to where you installed your client or the shortcut on the desktop of you opted for that and launch. Your client will automatically update. This may take time depending on your internet speeds. 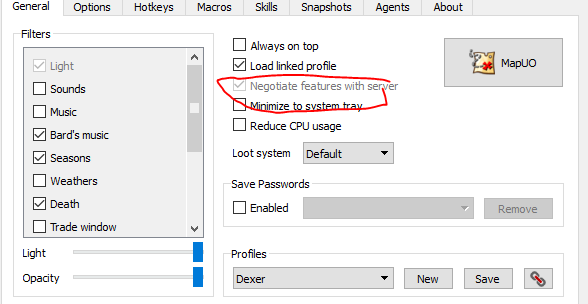 These are 3rd party assistant programs that let you to connect to our server, automate in game tasks, make hotkeys and macros as well as other useful things. We recommend UOSteam as it is more stable. UOrazor may be easier to understand right off the bat. You can have both installed without them conflicting so don't worry about your choice. Run your download from above and follow the installation instructions. Now that you've Installed Razor, you'll need to configure it's connection information. To do this, launch Razor from the desktop. And begin the character creation process! This guide was loosely based on a guide posted at uorevealed.com thank you for the great groundwork to help new players with a difficult process. maybe there is something you can turn off with negotiating features? OR did I not download the right client? I think I did everything correctly how you put in getting started here. Debugging - Show debugging information (fps count, scale , loaded object amount e.t.c). FPS rate - Desired fps count (Actual may differ from the one indicated here under heavy loads and / or at a slow video card). 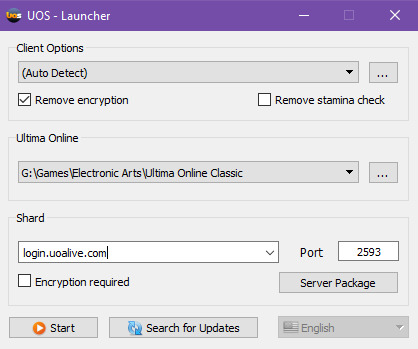 Reduce FPS when UO window is unactive - Урезать ФПС если окно неактивно. Standard characters animation delay - Standard delay between changing frames of living being animations. Standard items animation delay - The standard delay between changing frames of inanimated objects. Use scaling in game window - use scaling of game window (test version). Remove object's text with alpha-blending - text deleting with alpha blending (smooth text removal). Under character (Line) - Show under character (gump with hp line). HP lower % - hp is lower of displayed % of max. JPEG (by using this type, there might be crashes). Remove or new draw objects displaying with use blending - smoothly remove/draw world objects/statics with alpha-blending use. No draw roofs - without roof draws. Unzip the Orion Client into a folder of it's own. It is named Bin if you unzip it into it's own folder. 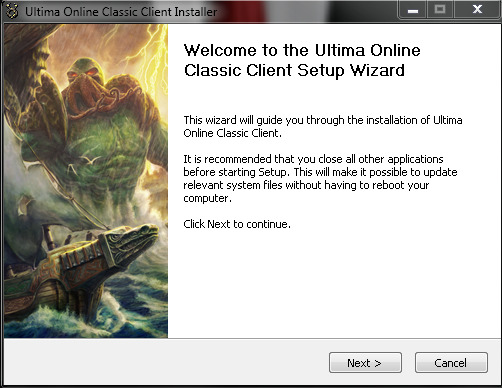 Take your UO Client and Copy ALL contents to the new folder your Orion client just made. Run Configuration Editor and load the file Client.cuo above. Now run the OrionLauncher.exe and Point your path to THAT folder. Run file to patch to latest game client. RUN, Install, Create an account. Very straight forward. 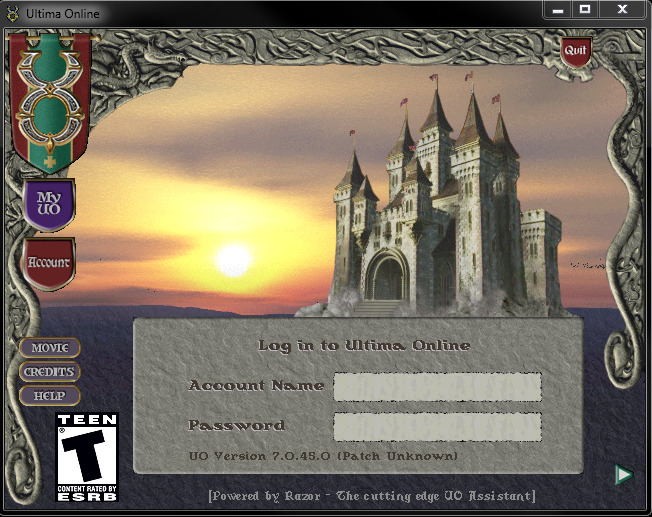 Enter login.uoalive.com in the server info and 2593 in the port. On account login, that is where you create the account, type in desired username and password! All set.